As many of you know, Aaron Scott and I have been doing some cross pollination with each other's sites. When he posts something that I think might elicit a fun or insightful post on my end, I use one of his cartoons to help illustrate the point. It's been my hope also that I've helped some testers discover his strip, Two Leaf Clover and enjoy it as well. Well, Aaron did something cool for me today. He made a cartoon just for me (well, for everyone really, but it's something we talked about a number of times). This strip will now reside on TESTHEAD permanently in the upper corner as a reminder to all of us, that we don't have to accept what has come before, and that the traditions of old need not define our future. As some have seen in the past, the "mascot" of the TESTHEAD site is the crash test dummy. It's a metaphor for getting information without us getting hurt. 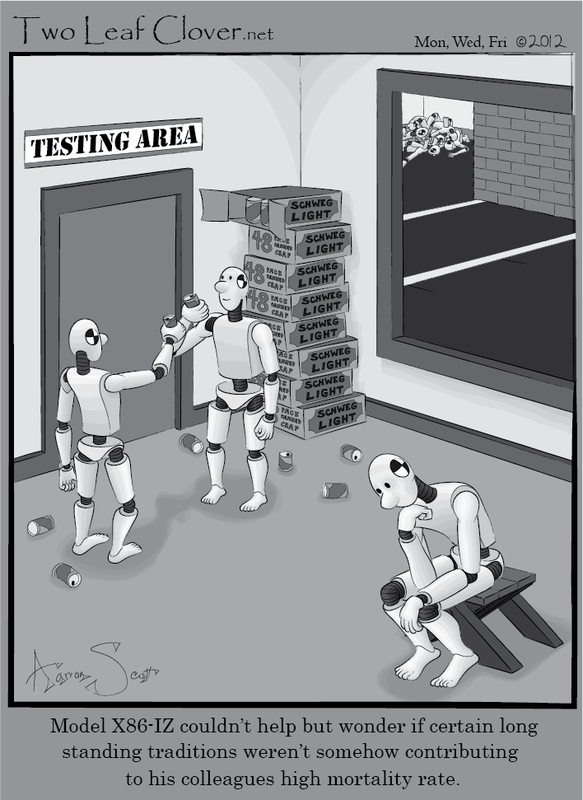 Of course, I've used the crash test dummy as a metaphor for myself as a tester. How often do I just go in and do stuff that doesn't seem to make any sense? How often do I run through endless checklists of steps because "we've always done it that way?" I told Aaron that I wanted to see TESTHEAD and other testing blogs be a way to help "empower the dummies" so that they don't have to specifically just be launched at walls, that they could say "maybe there are better ways to do things that we haven't considered yet". Oh, and I think it's pretty cute, too. So again, my thanks to Aaron for effectively making a TESTHEAD specific cartoon, and one that I can show, well, for always on here. It's much appreciated. For those who are not familiar with Two Leaf Clover, go pay Aaron's site a visit :). Your own custom cartoon ? Jealous !! The Long Tail Will be The Death of Me!